Farrell, who played Jadzia Dax on the '90s series Star Trek: Deep Space Nine, wed Nimoy, the son of Leonard Nimoy, on Monday in San Francisco. Actresss Terry Farrell and filmmaker Adam Nimoy arrive for the premiere of CBS's "Star Trek: Discovery" held at The Cinerama Dome on September 19, 2017 in Los Angeles, California. The couple recently wed.
May this marriage live long and prosper! Trekkies are bound to geek out over this wedding news. 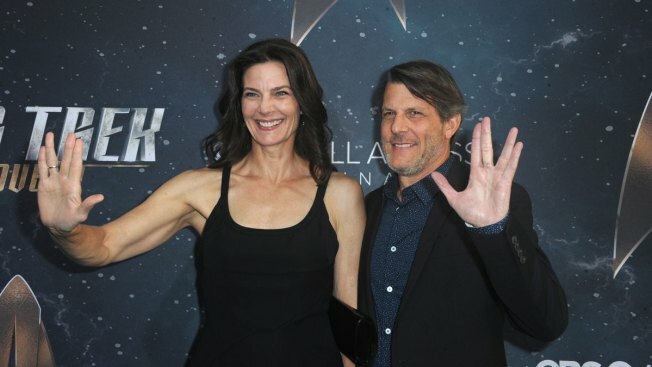 Terry Farrell and Adam Nimoy are officially husband and wife! Farrell, who played Jadzia Dax on the '90s series Star Trek: Deep Space Nine, wed Nimoy, the son of Leonard Nimoy, on Monday in San Francisco. Leonard became known as a Hollywood legend for his portrayal of Spock in the sci-fi series. He passed away in 2015, and this week would have seen the actor's 87th birthday. Film critic Scott Mantz broke the news on Twitter with a photo of the newlyweds in front of City Hall. Terry confirmed the nuptials, writing in her own tweet, "Freakin AWESOME day!!!!!!! Love ya all! Aka: Mrs. Adam Nimoy." The pair got engaged in Aug. 2017. This marks second marriage for both Terry, who has a son from a previous marriage, and Adam, who has a son and daughter with his ex-wife.